ROCHESTER, N.Y. – Semrock, Inc, today announced the release of its new 68-page, full-color 2008-09 optical filter catalog. This latest catalog presents eight product families, and introduces over 50 new optical filter products, for applications ranging from fluorescence instrumentation and microscopy to Raman spectroscopy and other laser analytical instrumentation. There is also a series of 22 helpful tutorial notes. 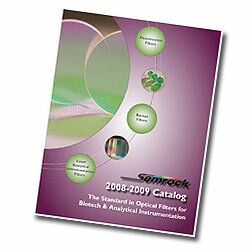 The 2008-09 catalog features many new products that further enhance Semrock's already extensive range of "no burn-out" BrightLine fluorescence filters. Of special note is the new line of Laser Fluorescence filter sets that are available for the most popular lasers used in fluorescence imaging, including newer all-solid-state lasers that are rapidly replacing older gas-laser technology. The catalog also features the latest additions to the state-of-the-art and ultra-steep "E-grade" RazorEdge long-wave-pass filters for Raman spectroscopy, and the MaxLine series of narrow laser cleanup filters, as well as a new line of EdgeBasic long-wave-pass filters. The new EdgeBasic filters are hard-coated optical filters that share all the high transmission (98% typical) and deep laser-line blocking (optical density > 6) performance of Semrock's popular ultrasteep RazorEdge filters, but with edge steepness that is tailored for cost-sensitive "application-specific" Raman systems, while adding wideband blocking that makes them excellent for fluorescence applications. Also announced with the new catalog are Semrock's new rapid custom-sizing services in under a week, and a 30-day return policy. Semrock manufactures and stocks a broad range of catalog products for biotech and analytical instrumentation applications, from the popular RazorEdge filters, complementary MaxLine laser clean-up filters, and StopLine notch filters for Raman spectroscopy and laser systems, to BrightLine filters for fluorescence microscopy and instrumentation. Most Semrock catalog products ship quickly, and all are covered under the company's industry-leading five-year warranty. Semrock manufactures quality optical filters that set the standard in performance and reliability for the biotech and analytical instrumentation markets. All Semrock optical filters are made with hard Ion Beam Sputtered optical coatings. OEM filters are manufactured in volume. End-users benefit from a wide selection of standard catalog products that ship from stock. Semrock's patented and patent-pending products include the highly acclaimed BrightLine series of fluorescence filters for research and clinical microscopy, high-throughput screening, real-time PCR, and other fluorescence-based instrumentation; state-of-the-art filters for Raman spectroscopy; and other unique laser analytical instrumentation filters. Semrock's innovative products, made possible by combining modern ion-beam sputtering with Semrock's proprietary volume manufacturing technology, are covered under an industry-leading five-year warranty. BrightLine, RazorEdge, MaxLine, StopLine and Semrock are registered trademarks, and EdgeBasic is a trademark of Semrock, Inc.